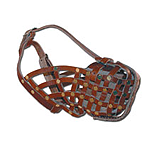 The Chow and Short-Snouted Cloth Muzzle is designed to fit Chows and all other short-snouted breeds. These Cloth Muzzles are designed for short-term use. They should be used as a temporary restraint only! Use only with direct supervision and never leave your pet unattended while wearing a Cloth Muzzle. Failure to do so could result in inhibiting the dog's panting (it's natural cooling mechanism) producing a life threatening situation. You should also be aware that most dogs can still bite while wearing an open-faced muzzle. Dogs wearing a Cloth Muzzle cannot pant or drink water while wearing them. 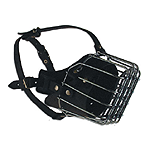 If you are interested in a muzzle designed to be worn for extended periods of time, please check out our Imported Wire Basket Muzzles. DogMuzzleStore.com is a sub-domain of Leerburg, the largest state of the art dog training website with over 16,000 webpages written and approved by Ed Frawley.